Offering tsog at the long life puja for Lama Zopa Rinpoche on the last day of the 2016 Kopan November course. The five dakinis are also shown. Kopan Monastery, Nepal, December 2016. Photo by Ven. Lobsang Sherab. 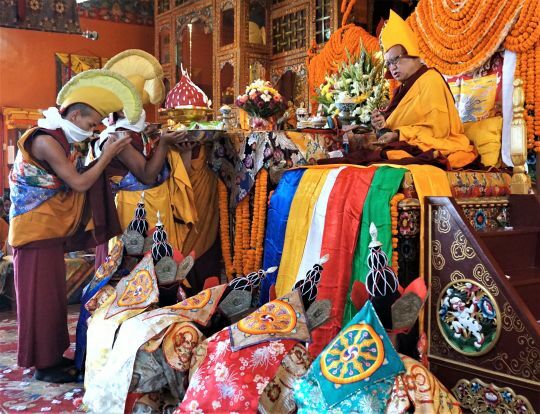 Every year, the Long Life Puja Fund supports a long life puja offered on behalf of FPMT centers, projects, services, and students to our most kind and immeasurably precious spiritual director, Lama Zopa Rinpoche. The next puja will be offered at Kopan Monastery, Nepal, on December 17 following Rinpoche’s teaching during the one-month lamrim course. 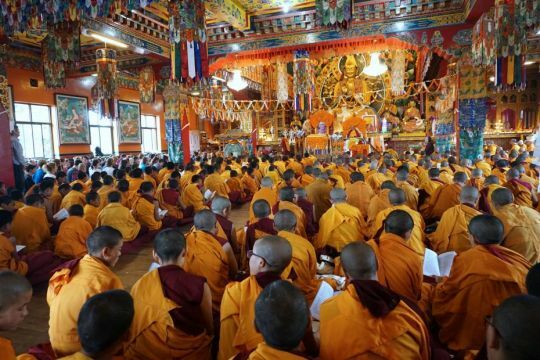 The ritual itself is the extensive Lama Chöpa with an added request to the dakinis, a moving plea by the students for the five dakinis who have come to take away the teacher to a pure land to allow the students’ teacher to remain with them on earth. The purpose of the long life puja is for students to purify the mistakes that occur in relation to their teacher, and to create the causes and conditions to continue to receive benefit from that teacher for a very long time. Extensive Long life puja offered to Lama Zopa Rinpoche at Kopan Monastery, April 23, 2017. By maintaining harmony, following Rinpoche’s advice and offering long life pujas, FPMT students are accumulating the merits so that our precious guru will stay in the world with us for a long time. Having the continued guidance of the guru depends on the merits of the disciples. We need to create the cause for us to keep meeting with the precious guru in future lives until we attain the highest goal of enlightenment, for the benefit of all. Rinpoche also regularly mentions that offering long life pujas is a cause for one’s own long life. All are welcome to participate in this long life puja by making a donation toward it. For your name to be included in this incredible offering, donations must be received no later than December 12th. The Long Life Puja Fund always contributes to long life pujas offered to Lama Zopa Rinpoche. You can also learn about the many Charitable Projects of FPMT and discover the many ways the various funds and projects are benefiting others.